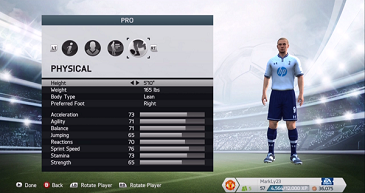 To create your Pro, simply start a new Player Career from the main menu. You can decide on a number of aesthetic details for your player - his facial features, body type, boots worn, etc. The only of these that really matter are the body type details. Larger players will be stronger on the ball and better at headers, but they will have less potential for speed. Smaller players can make better dribblers and obviously faster players, so one is not necessarily better than any other choice you could make for this. What it all comes down to is personal preference and playing style, so choose what works best for you. The only way to improve your player is by playing games. In games, you will control only your player with a team of CPU players. You will get a first person view behind your player as he moves around. The better you perform, the better your rating for that game is. Better performances will allow in turn unlock accomplishments will improve your players stats. Just having a high performance does not directly correlate to improving stats, you will only be able to get better stats by finishing accomplishments. For example, one accomplishment is to assist 5 goals from crosses and this will improve your 'Crossing' statistic by 1 point. As you play the game and perform well, you will simultaneously and probably unconsciously unlock these accomplishments. In general, if you play well your stats will improve. Every season, your manager will send you a message with Primary and Seconday objectives. Accomplishing these objectives will often come with bonuses but some will have a negative effect if you fail to meet those standards. If you don't meet these objectives, your manager could sell you to another team or play you less. To check accomplishments, go to the 'My Pro' tab from the Career mode dashboard.